“The funds our board of directors approved are a direct investment toward 120 youth internships in the Preserves this summer. We are pleased to support youth leadership and skill building while also helping to maintain the health of the Preserves." The Forest Preserve Foundation is pleased to announce its spring 2018 grants. Three awards, totaling $152,500, will go to support Forest Preserves of Cook County initiatives. With this latest grant cycle, the Foundation since its inception has granted in excess of $1.1 million toward its primary goal: increasing access for all to the Cook County Forest Preserves. “The funds our board of directors approved are a direct investment toward 120 youth internships in the Preserves this summer,” said Shelley A. Davis, Foundation president. “We are pleased to support youth leadership and skill building while also helping to maintain the health of the Preserves." A $75,000 grant will support the Forest Preserve Experience Program, the Conservation Corps partnership between the Forest Preserves and the Cook County Housing Authority. For 2018, 100 high school youth and leaders (ages 14 to 19) will be recruited from the South and West Sides of Cook County. They will be deployed to work at their local forest preserve, led by trained adult leaders and assistant crew leaders. Participants will conduct conservation activities including invasive species management, tree care and urban gardening. All youths attend a green career panel, designed to expose them to careers in the green industry. Participants leave with an understanding of what the Preserves offer and why healthy nature is important to their community and quality of life. The Foundation awarded $50,000 to directly support a 2018 Chicago Conservation Leadership Corps crew. 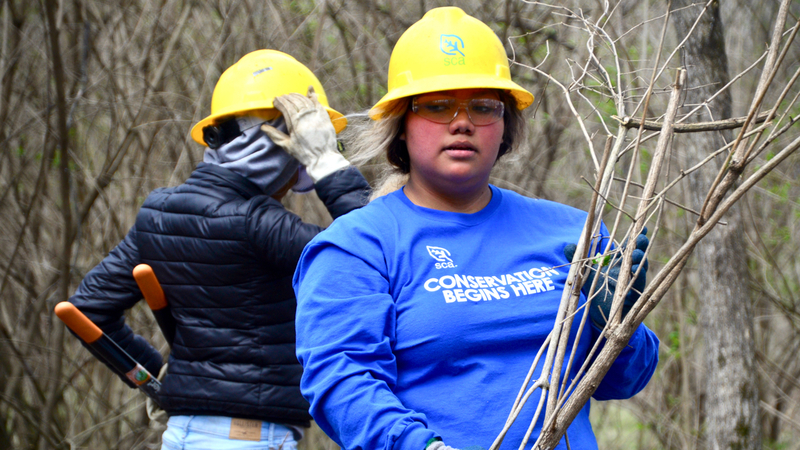 For six weeks, the crew of 14 teens and leaders will perform conservation work at a Forest Preserves of Cook County site. Funds, directly invested toward this crew, will cover youth and leader wages, supply and training costs, risk management supplies, member transportation, evaluation and assessment, insurance and worker’s compensation. During 2018, program members will collectively contribute more than 10,000 hours of conservation service toward the creation and maintenance of forest preserves and parks. SCA will recruit City of Chicago residents for this crew. The Foundation awarded a grant of $27,500 to the Forest Preserves to support teen leaders for nature-based programming in the Preserves. The Preserves will work in collaboration with community-based organizations that have experience in environmental education, youth development and curriculum development to directly supervise young people in a process to develop curriculum and program activities related to three projects. This team will work on the Dan Ryan Nature Play Area and Tree House, Sand Ridge Nature Center/Camp Shabbona Campus and Underground Railroad Hikes, and Beaubien Woods/Altgeld Gardens and Outdoor/Adventure Programming at that site.